Super Savings Item! Save 38% on the Aooyaoo 12oz/370ml Warmer milk pot suitable for a gas cooker and an induction cooker 18/10 Stainless Steel Mimi size by Aooyaoo at Baking Love. MPN: AY-MP- Milkpan. Hurry! Limited time offer. Offer valid only while supplies last. Turkish coffee in this stainless steel decanters (known as Ibrik in Turkish.) Ibrik's features include bell-shaped pot and contoured ABS handle. Turkish coffee in this stainless steel decanters (known as Ibrik in Turkish.) Ibrik's features include bell-shaped pot and contoured ABS handle. These Turkish style coffee pot are also ideal as cappuccino and milk frothing jugs. They can also be used for melting butter, warming milk, and making sauces. 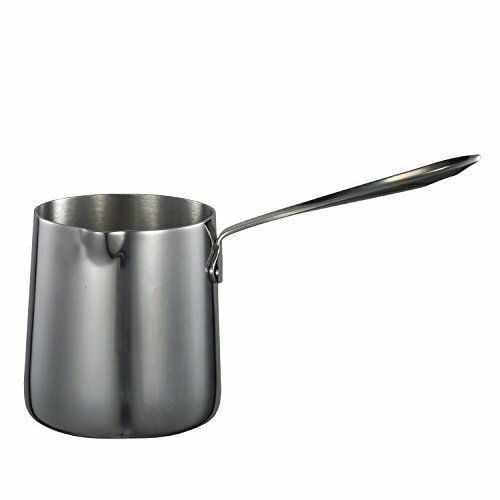 Features: made of high quality stainless steel, thickened at the bottom of the pot,Increased the durability of the product. Function: It can be used in electromagnetic oven or gas cooker.Warm reminder: This pot has a contact area of about 3 inches so if using on an induction cooking surface make sure your cook top will accept this small pot. Uses: can be used to heat coffee and milk, due to the size is small, each heating capacity is only suitable for 1-2 people to enjoy. If you have any questions about this product by Aooyaoo, contact us by completing and submitting the form below. If you are looking for a specif part number, please include it with your message.